Cryptomeria is a genus of only 1 species; C.Japonica. Though commonly known as the Japanese Cedar it is in fact not a member of the Cedrus family but a part of the Taxodiaceae family along with Yews. Cryptomeria Japonica is an evergreen, monoecious, coniferous tree native to the forests of China, Korea and Japan. Known for its naturally conical habit and its thick, red, fibrous bark, the C.japonica has narrowly wedge-shaped light-green (fading to dark-green) leaves arranged in 5-ranked spirals around its shoots. 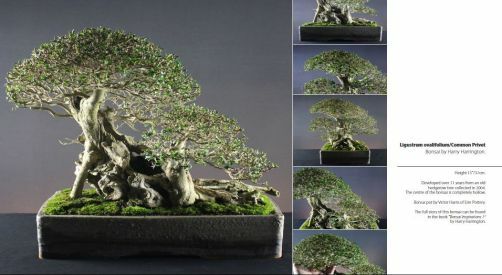 Many varieties of C.Japonica are commonly used for bonsai for instance; Elegans, Elegans Compacta, Pyramidata. There are a number of dwarf varieties that require less frequent pinching out such as Elegans nana and Globans nana however, as slow-growing varieties these can take considerably longer to achieve thick trunks and take longer to style. Positioning Cryptomerias need a light position out of direct sun during the summer with good ventilation. During the winter, some protection is required from frosts. Leaves commonly brown during the winter but brighten back to green in the Spring. Feed Every 2 weeks Spring to Autumn; from bud extension in April feed high nitrogen, a balanced feed from June and low nitrogen to strengthen the root system from August onwards. Repotting Every 2 years in mid-spring as new buds start to grow. Older specimens can be repotted according to root development. Repot in a standard mix. Pruning Continual, regular pinching out is required throughout the growing season to spread energy throughout the tree and to keep the trees' shape. Cryptomeria will backbud very readily from points all over the tree given regular pinching. Do not use scissors to cut foliage as this causes the cut edges to brown as with Junipers. Hard pruning can be carried out in Spring, however care must be taken to produce a clean cut as the bark and cambium layer separates easily from the wood. Wiring Wiring should be carried out between April and July to allow time for branches to heal before the cold of winter. The branches are very supple though they can separate easily from their junctions so care must be taken. Bend branches over 2cm in thickness slowly over the course of a few weeks as creating rapid movement over too short a period of time can result in the bark splitting. It is possible to prevent this by binding with raffia before the applying wire. Pests and Diseases Red spider mite and scale can cause problems, try to prevent this with regular misting of the foliage. Propagation Sow seed outside in Spring. Cuttings root very easily in late summer/early autumn from ripewood. Styles Most commonly seen representing its natural form, the formal upright with single or multiple trunk styles in extra-small to medium sizes. Branches are presented on a horizontal or slightly drooping plane with the foliage trained up above so that the branch structure is revealed.